Young visitors can bring their favourite bear and join Sally Tonge for BEAR, SING & SHARE. Enjoy songs and stories for the museum’s littlest visitors with Shropshire’s favourite grandma storyteller, Sal Tonge. She has stories of bears to spare and share. Sing and dance and cuddle up for a memorable story time to bring the exhibition alive! Standard Museum admission charges apply- under 5’s free. Everyone’s favourite bear, Paddington, returned for his second big film outing. The fabulous museum balcony is the location for the film screening of Paddington 2 rated PG. Paddington is happily settled with the Brown family in Windsor Gardens, where he has become a popular member of the community, spreading joy and marmalade wherever he goes. While searching for the perfect present for his beloved Aunt Lucy’s 100th birthday, Paddington spots a unique pop-up book in Mr Gruber’s antique shop, and embarks upon a series of odd jobs to buy it. but when the book is stolen, it’s up to Paddington and the Browns to unmask the thief. Seven Stories, The National Centre for Children’s Books, has brought the Bears special exhibition to Shrewsbury Museum & Art Gallery. Cuddly, friendly bears have featured in numerous books for children since the ‘invention’ of the Teddy Bear in the early 1900s. Many stories feature anthropomorphic bear characters with names and personalities. Discover the scary bear under the stairs, hunt for bears in the bear forest and enjoy original manuscripts and illustrations from Phillip Pullman, Michael Rosen, Martin Waddell, Julia Donaldson and many more. The Curators at Seven Stories approached all of the artists and authors who contributed to the exhibition with questions about their processes and inspiration for the story or characters. 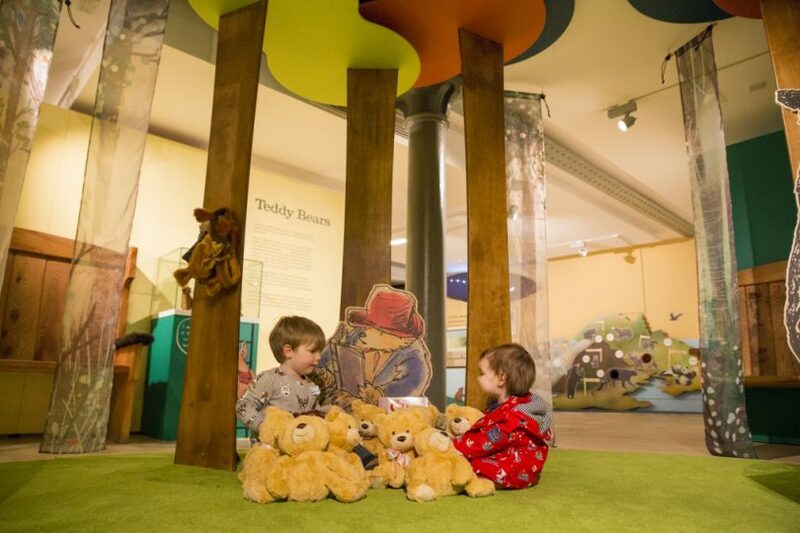 You can bring your own special bear to the museum and read a bedtime story in their cosy bear cave. Suitable for bear fanatics of all ages. Visit the Shrewsbury Museum & Art Gallery website for opening times and admission prices. All visitors can explore the museum with Maximo, the museum mouse every day. All the family can follow the footprints, spot the clues and find Maximo in his house?